It was noon in the rain forest. Gus the Gecko was hungry. Mom said, "I have to go hunt for our lunch. Wait here until I get back." "I am extremely hungry," thought Gus the Gecko . "I can't wait! 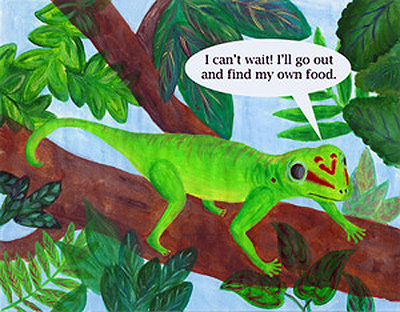 I'll go out and find my own food." 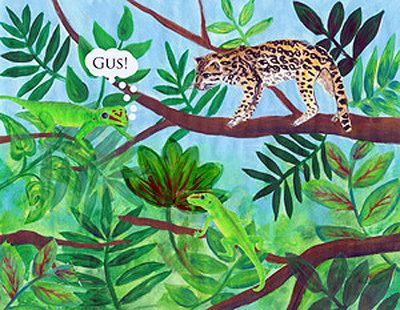 Gus the Gecko wandered deep into the rain forest. Gus saw something move in the clearing. 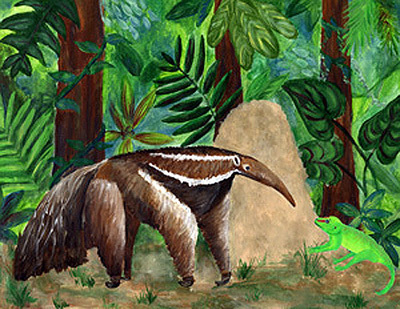 It was Andy the Anteater. He was eating ants. "Yum, those ants you are eating look delicious," said Gus the Gecko . "I am very hungry, can I have some?" 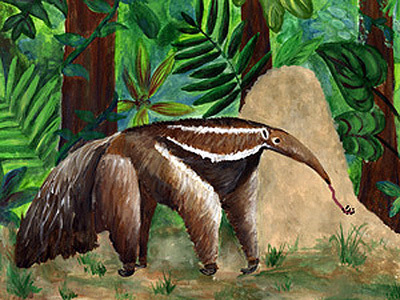 "No," responded Andy the Anteater , "I'm sorry, that was my last ant. I don't have any more to share." "I am very hungry," said Gus the Gecko . "I need to keep looking for food." 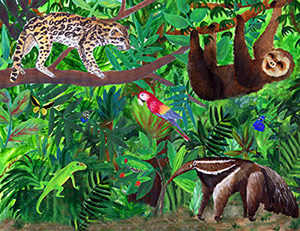 As Gus the Gecko wandered deeper into the rain forest, he spied a sloth. 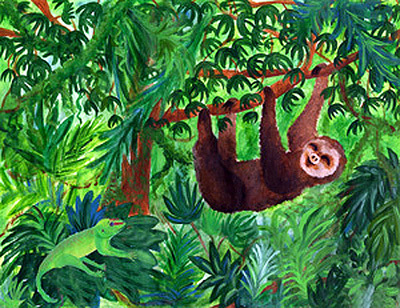 The sloth was hanging upside down from a Cecropia tree. 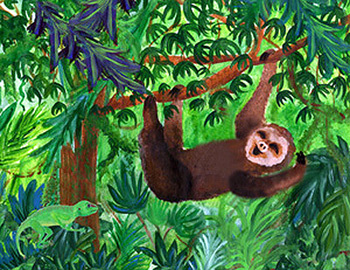 "I am very, very hungry," Gus called to the sloth. "Do you have any food for me to eat?" Sammy the Sloth stretched and yawned. "I'm sorry, I just ate my last leaf, and now I am about to take my nap. I don't have any more food to share." 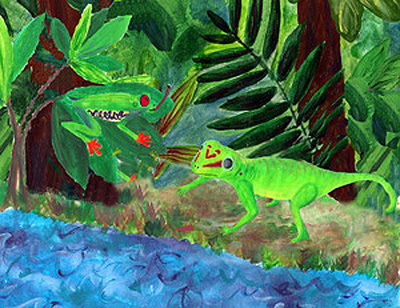 As Gus the Gecko wandered deeper into the rain forest, he saw something bright red in the top of the trees. It was Megan the Macaw feeding fruit to her babies. "I am very, very, very hungry. Do you have any food for me to eat?" asked Gus. "I'm sorry," said Megan the Macaw, "This fruit is for my babies. I don't have any more to share. 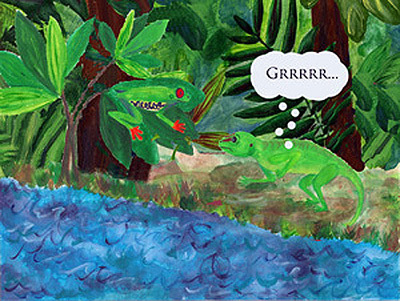 As Gus the Gecko wandered deeper into the rain forest, his stomach began to growl. Gus came upon a big river. He saw a frog with red eyes and orange feet. It was Roberto the Red-Eyed-Tree-Frog. "I am very, very, very, very hungry," said Gus the Gecko . 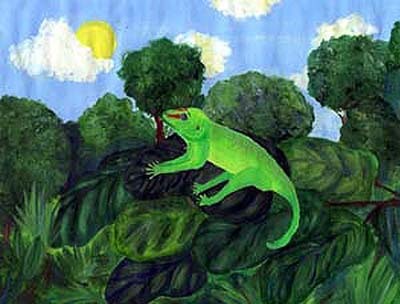 Roberto the Red-Eyed-Tree-Frog had just swallowed his last fly. "I'm sorry," Roberto said, "I don't have any more flies to share." 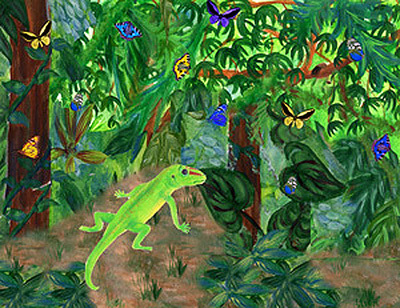 Gus the Gecko wandered even deeper into the rain forest. He saw Oksana the Ocelot sitting high up in a tree. "I am very, very, very, very, very hungry," Gus told her. 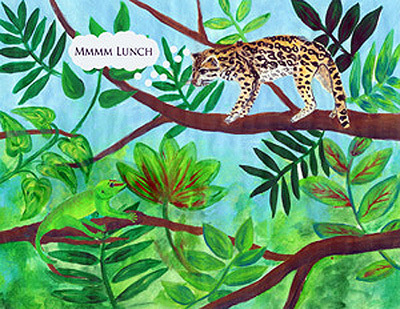 Oksana the Ocelot licked her lips and growled, "I'm hungry too! And I love to eat lizards!" At that moment, Gus the Gecko heard his mother calling him. He quickly ran home through the rain forest. "Lunchtime!" said Mom. "I have lots of food to share." Dedicated to the children at the Davis School in Brockton, MA. 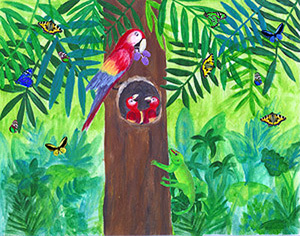 This book is an adaption of 'A Rainforest Adventure' by Janice Marino, Megan Hunt, Connie Reed, Terry Ferro, and Helen Virga from the Davis School in Brockton, MA. 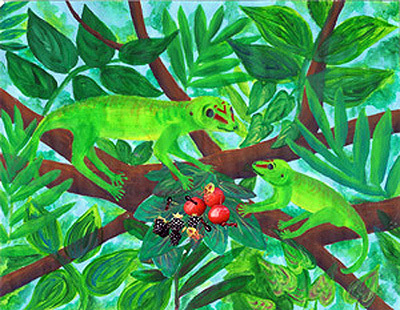 Clipart.com: Rainforest (zealand, green, trees), Gecko (reptile, gecko, lizard), Hunting (outdoor, lion, nobody), Anteater (feeding, pampas, mammal), Share (sharing, women, three), Macaw (bird, parrot), Red eyed tree frog (tree, nobody, red), Ocelot (outdoor, lying wildcat) © 2009 Jupiterimages Corporation all rights reserved.